A few weekends ago, I was convinced the springlike temperatures meant winter was behind us here in Georgia, but alas, we've dipped back down to the freezing-cold fifties (that's freezing by *my* standards), so alas, I can only dream of spring. But I was delighted to find spring's return in the form of one of my favorite annual magazines! 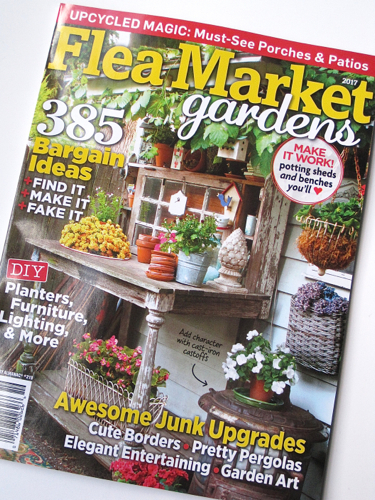 I found a copy at Ingles over the weekend, and since this magazine always seems to disappear quickly, I wanted to alert you fellow garden- and flower-lovers as well that Flea Market Gardens 2017 has arrived. I love to incorporate old stuff into the garden, and since I've totally neglected my home's landscape for about two years now, this is the year I'm going to make myself whip things into shape. 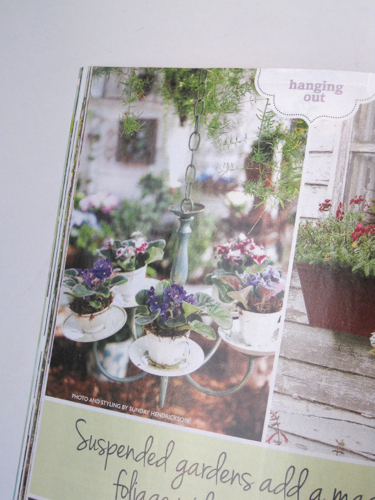 The first idea I fell in love with in this magazine, though, is an idea I want to use indoors: a teacup chandelier for displaying African violets! I'm rooting some new African violets right now, so I hope I can find a thrift store light fixture in time for some quick upcycling. And while I don't know what this particular plant is, the cutline says to fill a teacup with "any low-growing, cool-weather-loving alpine plant," so I guess I'll be researching that. Isn't it lovely how the little plant spills out of the teacup? 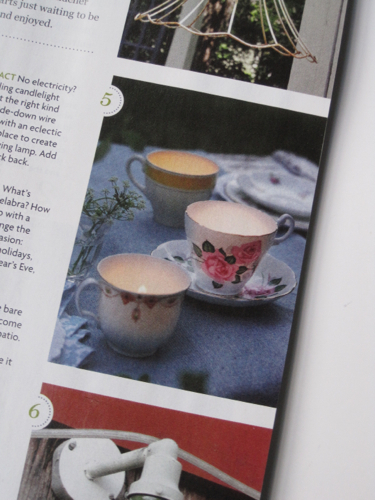 Finally, another of those so-simple-why-haven't-I-thought-of-it-before ideas is to simply use vintage teacups as containers for tea lights when entertaining outdoors. 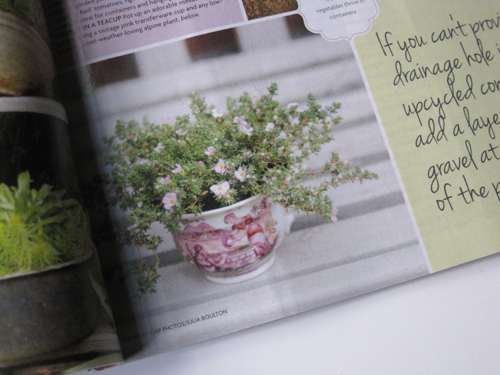 The issue also has lots of ideas for container gardens and fairy gardens, including one made using a vintage suitcase that is absolutely darling. So if you're like me and ready to putter in the garden but the weather's not quite there yet, be sure to grab this issue before it disappears from your newsstand! 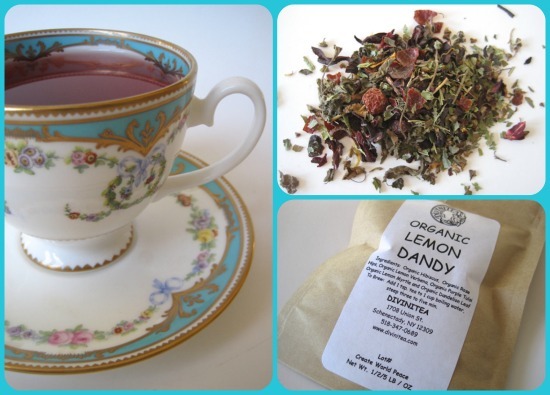 Last year, a new friend gave me a nice big bag of tea samples to try, and the one I've been enjoying this week is the Organic Lemon Dandy tea from Divinitea. This tea contains organic hibiscus, organic rose hips, organic lemon verbena, organic purple tulsi, organic lemon myrtle and organic dandelion leaf. 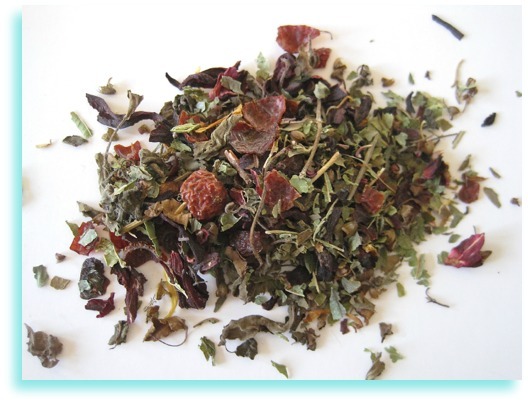 It's a refreshing herbal blend that tastes like a nice marriage of citrus and berries (from the rose hips, maybe), and I'm enjoying it as a lovely change from all the mint and oolong teas I've been sipping lately. And in honor of the new "Victoria" series on PBS, I reached for a teacup I've neglected for a while, one I bought in the gift shop at Windsor Castle a few years ago. 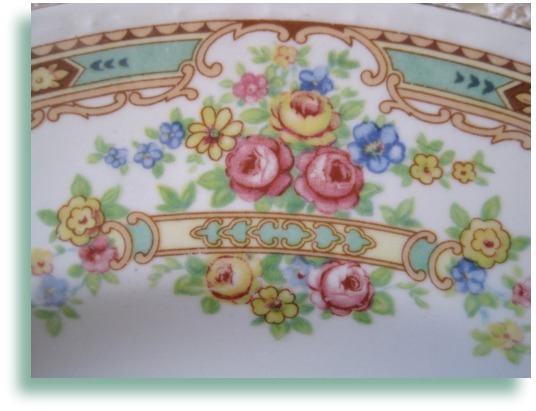 The pattern comes from a Minton dessert stand purchased by Queen Victoria at The Great Exhibition in 1851, and I think it's a dandy teacup to use for my "Victoria" viewing this winter! So are you watching "Victoria" on PBS? I missed the first episode but caught up online and then watched it on TV Sunday night. Count me in! I had actually started rewatching my old "Downton Abbey" DVDs the other weekend, but then I realized "Victoria" was in progress and knew I wanted to watch. Queen Victoria is well worth studying, and some years ago, I read a terrific biography of her (reviewed here with some Queen Victoria tea-related tidbits from the book). The show is, of course, as lavish and spectacularly filmed as I hoped it would be. And I noted on the PBS site that they confirmed it was indeed John Brown who "taught Victoria how to put a nip of Scotch in her tea." If you haven't yet watched the show, click here to see a preview … and grab a cup of tea because you'll be hooked! Last week I was sorting some old notes and letters when I came across a recipe I had saved from my tea-loving pen pal in New York, Sandy. 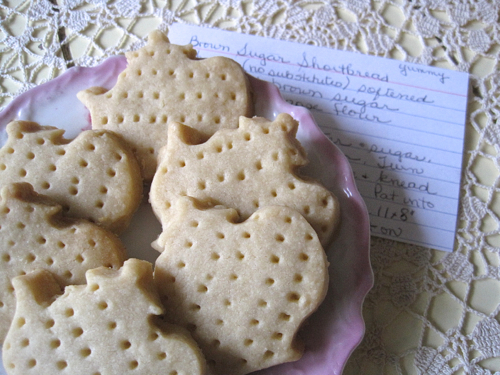 She had shared the recipe for her Brown Sugar Shortbread, which sounded intriguing since I've never made shortbread with brown sugar, only with regular old granulated sugar. Over the weekend, I tried her recipe, and I was thrilled with how easy and delicious it was. And just three ingredients! 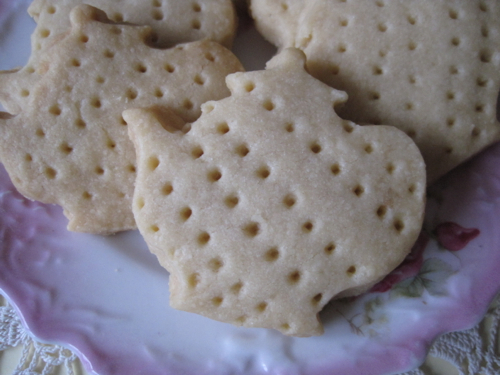 If you'd like an afternoon treat of shortbread with your tea this week, I highly recommend this recipe. Preheat oven to 300 degrees. Cream butter and sugar. (I used a hand mixer.) Gradually stir in flour. When blended, turn out onto a lightly floured surface and knead till smooth, about 3 minutes. I used a rolling pin that flattens the dough into a perfect 3/8-inch thickness and cut out cookies with a small teapot cookie cutter. Place cookies 1 inch apart on ungreased cookie sheet, prick with a fork, and bake for 25 minutes, just until bottoms are beginning to brown. Yields about 40 (2-inch) cookies. And as Sandy noted on her recipe card, they are indeed quite yummy! Jennifer Miller! And Jennifer, I've sent you an email asking for your mailing address so I can get these in the mail to you. Congrats! "Tea for three at three"
I am making it a point to check the Library of Congress website periodically to be sure I don't miss any new additions to their collection of tea-related photos. This week, I came across one I'd not seen before, a 1931 image titled "Tea for three at three aboard the Detroit Mackinac Chicago boat." Now I wish the photographer hadn't chopped the shoes off the lady at far left, but I sure enjoyed seeing all these great clothes as well as the shoes on ladies number two and three. When I see a vintage photo like this, I am always tempted to make up a story to go along with it. 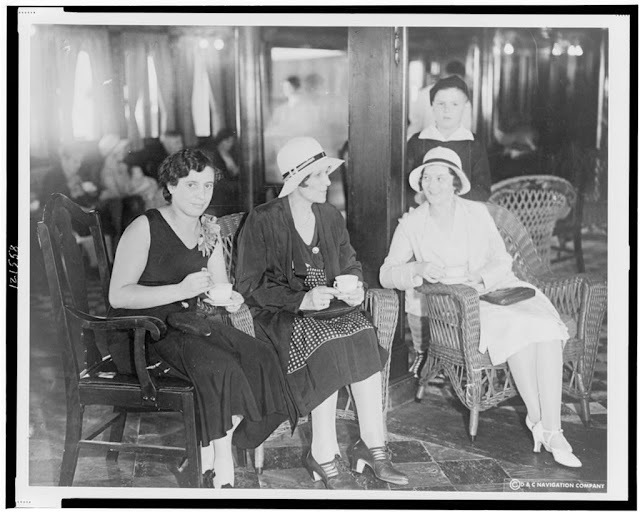 Who were these ladies, and why were they taking tea together on this boat? And who is the little boy standing behind the woman seated at right? Her son? Her nephew? Her charge? And more important, what brand of tea were they sipping? I love seeing vintage photos of women together, and I hope you do as well! 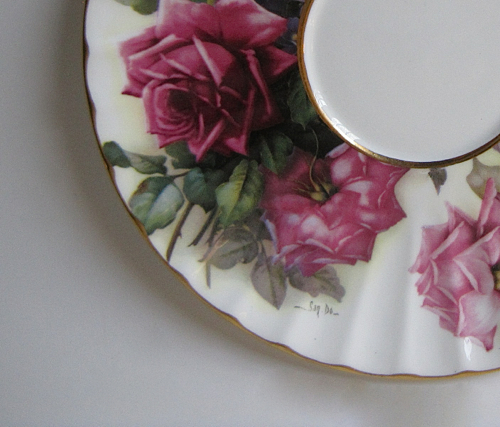 Years ago, one of my Christmas gifts from my mother was some pink Depression glass plates I had wanted in the Old Colony (also known as Lace Edged) pattern. I opened the box, thanked her for the pretty pink plates, and set the box aside again until months later when I actually unpacked the paper-wrapped plates to use them for something. I knew the box was heavy, but hey, Depression glass weighed a lot, so I didn't think too much of it. 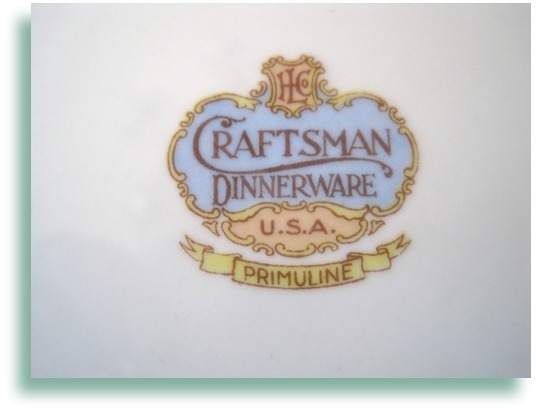 Until I unwrapped all the pink plates and found there were eight more plates in the box, these Craftsman Dinnerware Primuline plates from Homer Laughlin! I thought they were pretty, and it was like getting a gift all over again, but I never actually pulled these out to use them until last week. I added some pink glasses, napkins in teapot napkin rings, and some smaller pink glass plates that sat atop the Primuline plates. All I needed now was to order some teacups to match, and perhaps a teapot and sugar and creamer. So I looked on eBay. Nothing. And then I looked on the granddaddy of all dish sites, Replacements.com. No teacups are in stock, and so far I can't find a picture of a Primuline teapot on the internet to even prove one ever existed! 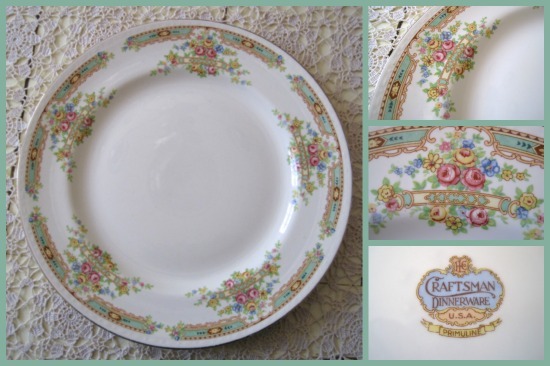 I must confess I was shocked, because all these years, I have simply assumed that if my mom so easily found Primuline plates at a garage sale (which I'm sure she did), then it must be an easy pattern to collect. Not so! I have, of course, set up eBay alerts for this pattern, and meanwhile, I'm asking all my spies friends in the area to be on the lookout for me. Primuline. Sounds like "primula," if that helps. 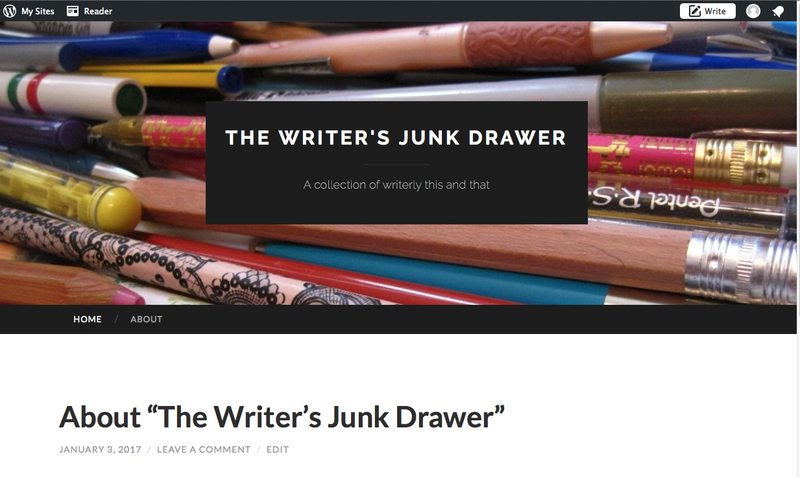 Still, a fun collecting adventure may be ahead of me this year, and if I find a coveted Primuline teacup, you can bet you'll be reading about it here! Well, Spring has arrived, sort of! It was 73 here in Newnan yesterday, and as my sister put it, "I'm glad we survived our harsh winter last weekend." Indeed. But the warm temperatures sure have me thinking about the garden and Easter and springtime, and when I saw these Spring-looking tea towels at HomeGoods, I decided they would be the perfect giveaway item for January. 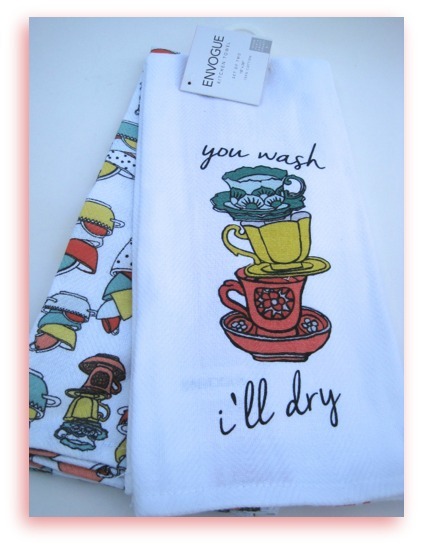 The first one says "You wash, I'll dry," and the second one sports an all-over teacup and bowl design in a cheery palette. If you'd like to win them, just leave an "Enter me" to this comment before Friday, January 20, at 7 a.m. and you'll be entered to win. (US and Canada only, please.) Good luck! Deb and I became friends not long after she called me at the newspaper one day to see whether I might be able to help her find a nurse for Kevin Costner. He was in the area to film the 1994 movie "The War," which was set in rural Mississippi in the early seventies, and apparently he needed someone who'd been a nurse in the sixties who would know how to bandage him accurately for one of his scenes. Deb was doing some PR work with the movie back then and was asked to find a nurse, and she knew the people in a small-town newsroom might know a good one. So I asked around in the newsroom, one of my friends mentioned our retired-nurse friend Harriet, and of course she was *thrilled* to be asked to visit with Kevin Costner and see about bandaging him! Who wouldn't have been? As a thanks for my minuscule role in all this, my new friend Deb, who I'd known only by reputation, got me onto the set one day, so I got to stand around and drool over the romantic hunk—along with all the other women. Deb moved away, and I hadn't seen her in years. I was thinking of her one morning this week, though, because of something I saw on the news that jogged a memory. That very afternoon—and years have gone by since I last saw her—I got a call from Deb. Now isn't that interesting? She'd found some old press club memorabilia she wanted to send to me and Alex, and she advised me to be careful opening the package, as there would be something breakable inside. 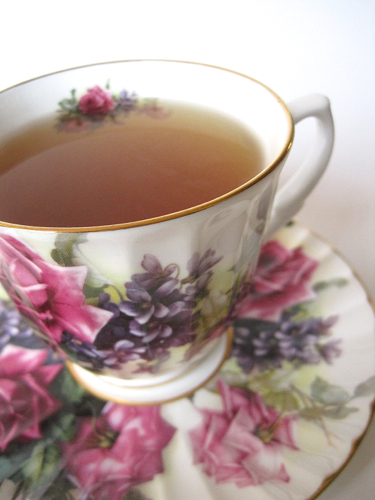 I thought it might be an old press club award, but no... it was this gorgeous teacup and saucer! 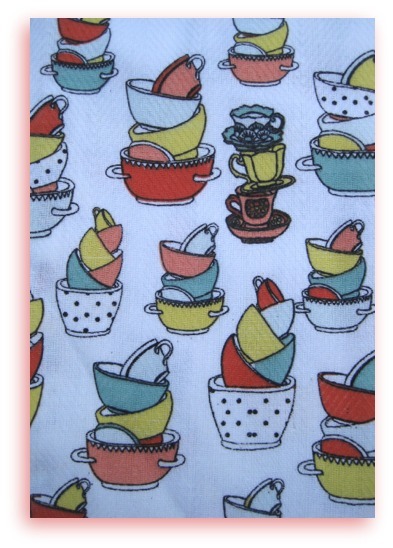 I absolutely adore the teacup and didn't have one like it! 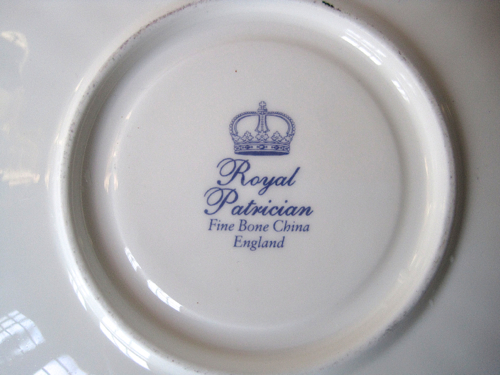 And did I just make this up or did I read somewhere in blog land that Royal Patrician has gone out of business? At any rate, I was quite happy to be back in touch with an old friend (my "six degrees of separation" from Kevin Costner), and also happy to have received a beautiful new teacup. And Kevin, if you're reading today, stop by anytime. Alex and I will have the tea waiting! I must confess the cute tin was one factor. The tea was only $5.99, which was a good price, but they also had some other great brands of tea, as well as some of those pretty Wedgwood tins of tea. 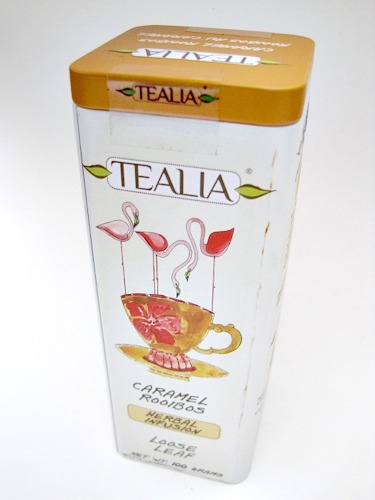 But a well-designed graphic gets me every time, and this tin of tea was the winner. The caramel tea, by the way, is just delicious. 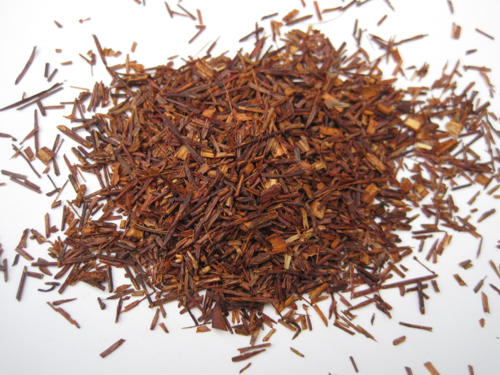 It's sweet and caramelish and had that classic rooibos taste I was expecting, so I was very pleased with my purchase. 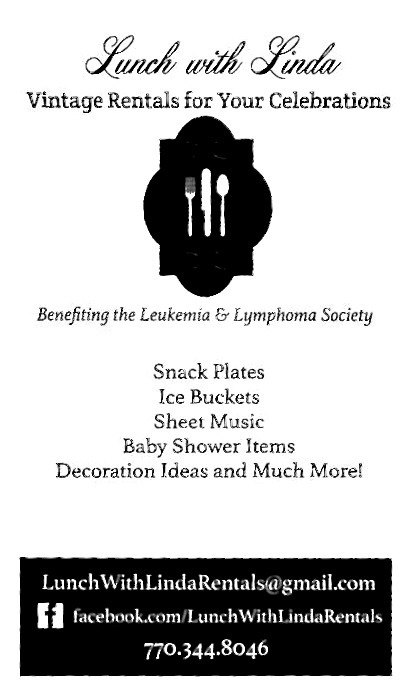 So tell me, have you ever read about a food and then had to find that food to eat or drink? I am very to sorry to report that I have no snow pictures to post today because those wacky Atlanta meteorologists got it wrong again. No snow. Not one flake at my house, only a little ice in the trees and on the deck. 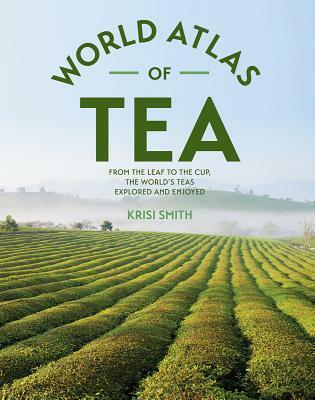 But I still spent a goodly portion of the weekend reading, and my first official tea read of the year is a review copy I received in the fall, the beautiful and highly informative World Atlas of Tea by Krisi Smith. Part One focuses on Tea Basics and covers such topics as the tea plant, varieties of tea, and grading of tea. Two entire pages of this section are dedicated to "The Chemistry of Tea," a level of detail I was pleased to find. 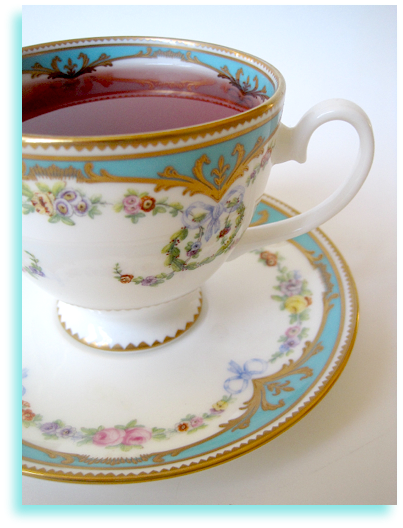 Part Two, Tea Brewing and Drinking, includes information on brewing basics, tea tools, buying and storing tea, and the health benefits of tea. One particularly helpful item in this section is the "tasting wheel" that gave me some new names for those tea tastes I am not that great at describing. With this new tool at my fingertips, perhaps I can increase my tea vocabulary when I'm reviewing teas this year. 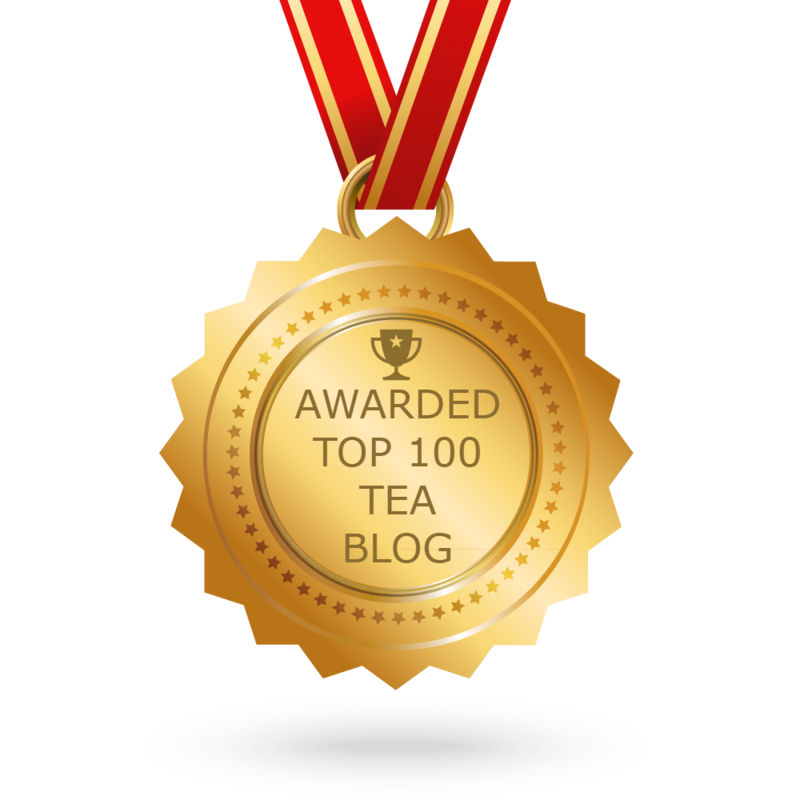 Part Three is on Tea Blending, which I'm not interested in exploring, but if you are, there are plenty of tips to get you going. Part Four, almost half the book, is on The World of Tea, and it's here that this book really finds its value in the tea library. This section includes a vast amount of info on the tea-producing countries, and it was fascinating to read, for instance, that Sri Lanka exports 94 percent of the tea it grows, "the largest percentage in the world." Who consumes the most tea? I've always heard that the Irish do, but Smith says that the people of Turkey actually consume the most tea—on average, more than 10 cups each day. 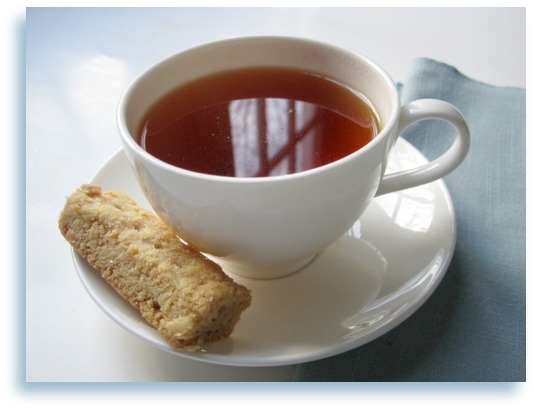 And while I knew that Kenya was a tea-producing country in Africa, I did not realize that Kenya leads the world in exports of CTC (crush-tear-curl) black tea "and makes up 22 percent of the world's exports of tea." The book doesn't include footnotes or a bibliography, but anyone willing to do a little digging should be able to further research any of these topics that inspire—and they will. The photography in this book is often stunning. Tea fields are a beautiful sight in and of themselves, but to see them at spots around the world is a joy. So are the photos of clay teapots for sale at a market in Hong Kong, a modern tea picker in Sri Lanka, and one of my favorites, that highly decorated teahouse in Iran. I spent several minutes gazing at this photo and trying to identify all the props hanging from the ceiling alone: lamps and globes and prisms and teapots and random glassware and … well, I'll save some of the examining for you. If you're looking for a new book to educate, enlighten, and entertain you about tea, World Atlas of Tea should do the trick. Here in Georgia, the big, big news is that we may get some snow today or tomorrow. I'm talking three or four inches, aka "a blizzard" by Georgia standards! That means we've all made a run on the grocery stores (and in my case, two libraries to make sure I'm a well-stocked reader if I am indeed snowed in). Happily, I also have a well-stocked tea cabinet, and the snowy, gray skies this week had me thinking about snowy teawares and "grey" tea. I was at a meeting the other night when a new friend, Cynthia, handed me a cute gift bag and said there was something in it for me. She knows I like tea, and she and her husband recently visited Savannah and brought me back this Savannah Grey blend, which she noted is her husband's favorite, and some delicious Scottish shortbread. What a lovely and unexpected treat here in the first week of January! I looked at these tea leaves before I even read the label, and I was instantly struck by how lovely they were. 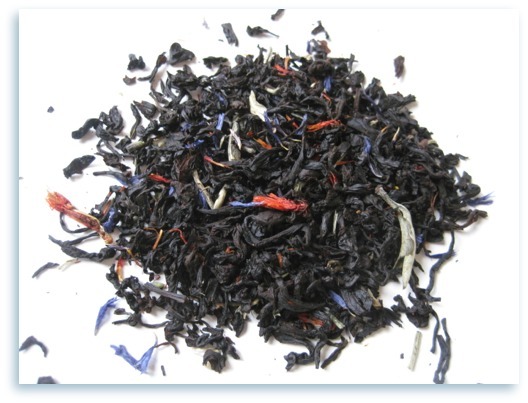 I knew by the variety of leaves this wasn't just an extra bergamotty Earl Grey but something special. 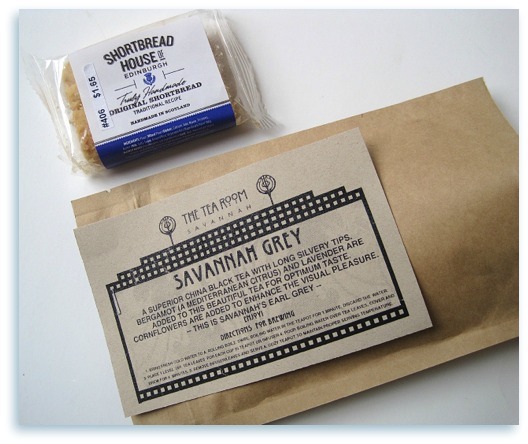 Savannah Grey, according to the package, is "a superior China black tea with long silvery tips. 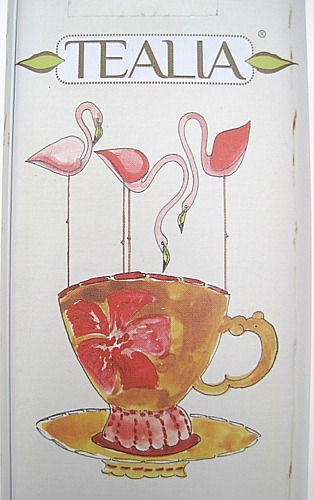 Bergamot (a Mediterrean citrus) and lavender are added to this beautiful tea for optimum taste. Cornflowers are added to enhance the visual pleasure. This is Savannah's Earl Grey." And I must tell you, it was absolutely divine! I've had lavender-flavored teas before, and I've had Earl Grey teas before, but Oh. My. Goodness. This blend had a richness and a depth that's quite unlike any other Earl Greys I've tried. I can see why my friend's husband loves it—and the fact it comes from The Tea Room in Savannah (no longer a tearoom, but they do still sell teas in a local book shop) is a delightful bonus. (They also sell them online here.) So if I'm snowed in with my books and tea this weekend, I believe we shall get along just splendidly. One of my goals for the new year is to drink more green tea, and that was made easier when my friend Susan gave me two tins of green tea for Christmas. 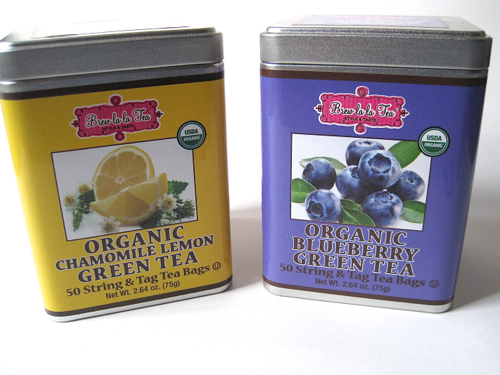 These teas are both by Brew la la Tea, a company whose name made me smile! Happily, the teas did too. 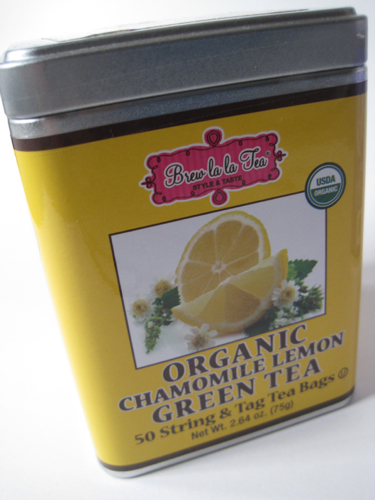 First I tried the Organic Chamomile Lemon Green Tea, which had a bright, sunny lemon taste. It wasn't a mouth-puckering lemony taste at all, and this wasn't a grassy-tasting green tea, so that was nice. Perhaps it was "softened" by the chamomile, but at any rate, I very much enjoyed this tea. 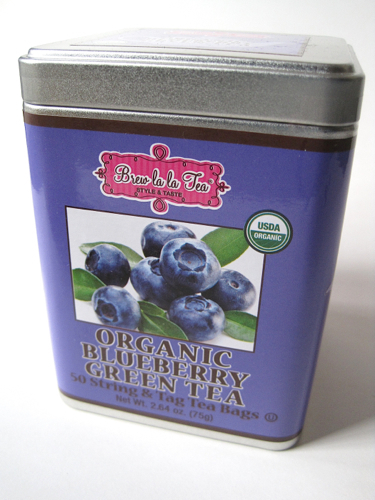 Blueberry teas can veer off into "tart berry" territory sometimes, but this Organic Blueberry Green Tea did not and made a wonderful evening cup of tea. So I'm off to a good start with my drink-more-green-tea goal for the year. So there you go! 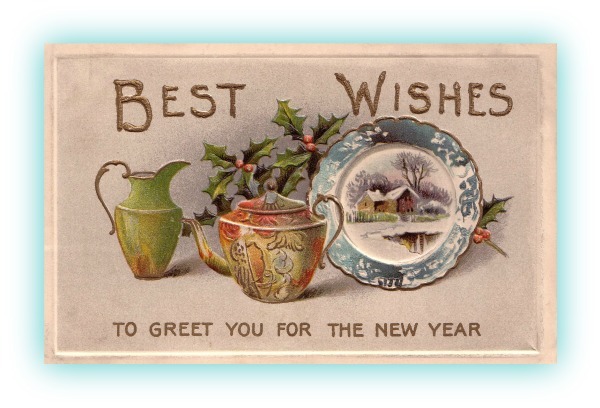 Do you have resolutions and/or goals for the new year? If so, do you have any "tea goals" you can share? I'd love to hear them! 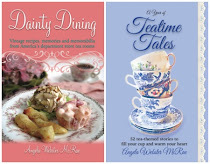 In case some readers didn't see my post a few weeks ago, I am now on a Monday-Wednesday-Friday blogging schedule here at Tea With Friends. 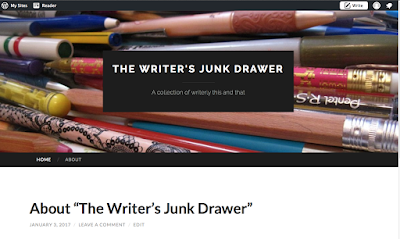 Today launches my new writing blog, The Writer's Junk Drawer, which appears on Tuesday and Thursday, and you can find it here. 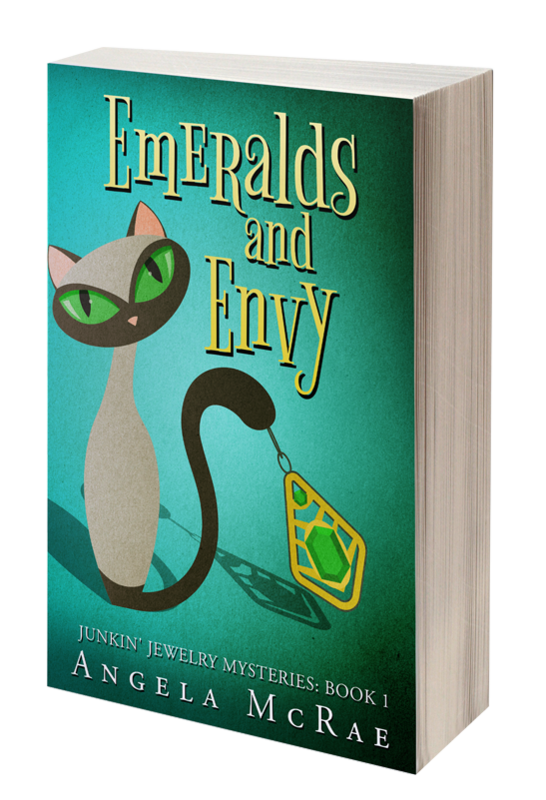 And if you're interested in writerly and bookish stuff, you can follow me by "Liking" my "Angela McRae—Writer" page on Facebook here. Thanks!